Name the historical figures pictured below. Nowhere in this quiz does it say "world history." This is a US website. Most of the people on here are American. We're going to recognize American Historical figures. Exactly. We not only learn World History in the US, but also US History. So why wouldn't we be more familiar with figures from the US? This is an open website on the WWW - don't think you can call it "American". And where do you get these statistics? To be "fair", Americans tend to consider themselves to be "the World", as in World Championship, World Series... I'm not sure at all that most people on this website are American, and even if they were, it probably wouldn't hurt some Americans (by far not all of them) to gather some perspective about what "history" actually means. May I remind you that if we consider Herodotus to be the first historian, you've joined the timeline after about 80% of it had already happened? drunken gandalf, your comments are highly ironic considering your comments are anything but fair, and you don't seem to have a solid grasp of history yourself. At least you put "fair" in quotation marks. To (actually) be fair, the United States is a part of the world, and in the same way that events in Pharaonic Egypt, Classical Greece, Imperial Rome and Victorian England are a vital part of world history, events in the USA and American colonies over the past four centuries are also a vital part of world history. Since the decline of the European empires and the rise of American industrial might in the 1800s, to a large extent, world history IS American history. To be fair. Of course, "to be fair", all our quizzes tend to focus on Western History at the expense of the East. China was the world's most powerful country throughout most of its history and we at JetPunk almost completely ignore them. Why? Because the users of this site are primarily Westerners. Our goal is not to be fair, but to be entertaining. "Joined the timeline"? That makes it sound as if Americans just appeared on the continent across the pond. Most of them were British once. They had a history before America. If that makes sense. Getting back to the original point, you'd expect Americans to know about Ho Chi Minh because he was the leader of the only country that ever beat the US in a war. Ah, kalbaham-sandwich-ut, making fun of people's names, that's very professional. I know whose side I'm on. Quizmaster: first of all... China has only been a country since 1949 and never once since 1949 has it been the most powerful country in the world. You are succumbing to the nationalist fallacy that current nation-states have a history that extends back to all the people that that nation state claims to be directly descended from. There have been a wide variety of different states in the area that the country of China now occupies. The vast and overwhelming majority of which were also never the most powerful countries in the world. 2nd, if you're going to rope in every entity that ever existed in this territory under the all-encompassing umbrella of "China" as if they were the same thing... then... I think you're still wrong. Check out this graph for a start (from a good book worth reading). 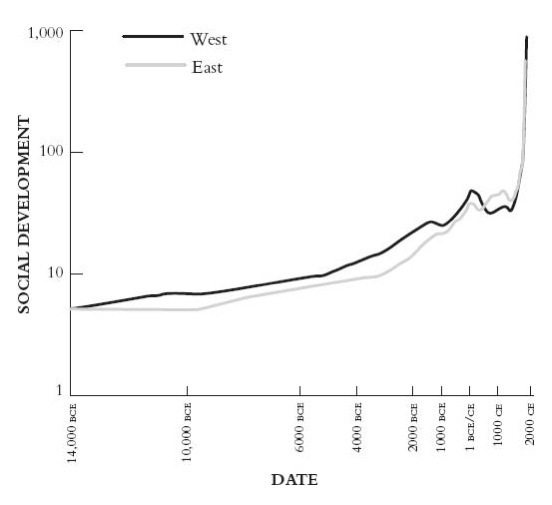 It's hard to see from the scale of that graph, but, according to the metrics the book used China's social development lagged behind that of the West's for thousands of years. Civilization began in the West much earlier and got a head start. People in Mesopotamia started cultivating plants 2000 years before anyone along the Yellow River did the same. When Ancient Egypt was building the great pyramids of Giza and erecting great carved stele full of hieroglyphs, the people who lived in the land that would become China were still in the stone age. When Alexander conquered most of the known world "China" was divided into many different warring states; the Qin would not (mostly) unify these states until over 100 years later. At the height of its power the Roman Empire was certainly much more powerful than China was at the same time. It wasn't until after the collapse of Rome when Europe entered the Dark Ages that China took the lead. ...and that lead only lasted until about 1800 when the West (first the British Empire, then the United States) first eclipsed and then rocketed past China. The USA has maintained the lead since then even if it's likely that China will overtake them at some point in the not too distant future. Anyway... point taken about entertainment > fairness. And I appreciate your occasional efforts to make the quizzes more international or teach us something about China. :) But, to be fair, there *is* a reason why modern history texts focus more on Western civilization than Eastern and it's not just cultural chauvinism. by the way I found the text of that book in pdf form in its entirety if anyone wants to read. Though I recommend buying a copy. Wow, OK, pretty shrill. a) China was a country long before 1949; b) "American" history started long before "four centuries ago," or "80 percent of the timeline had already happened"; c) I also find the original point interesting - that more people recognized the image of Robert E. Lee than the one of Ho Chi Minh. No, nowhere does it say that this is a U.S. history quiz, but if almost half of the pictures were of Italians (to say nothing about Indians or Nigerians), it would strike many as odd, yes? a) no, it wasn't. The People's Republic of China (China) was founded in 1949.
b) depends. United States (American) history could be said to have begun in 1776 when the country was founded. But of course the people and lands eventually incorporated in to that country have histories that extend back much farther than that. c) If half the people on this quiz were Italian that would indeed be odd. Sort of like if half the people on the quiz were from Texas. On the other hand, if half of them were European (and they are), it wouldn't be any more strange than if fewer than half of them were American. Kalbahamut, so in that graph earlier, is South Asia part of West or East? If it is, which one? Seeing how worldly you are, how many languages can you speak/read/write? That book focused mostly on Eastern and Western civilization as defined in the book, with Eastern civilization being all the civilizations that descended from the earliest civilizations around the Yellow and Yangtze river valleys and Western civilization being all the civilizations that descended from those of Mesopotamia. The latter includes the Levant, Egypt, Arabia, Greece, Rome, Europe, and the lands colonized by Europeans, but since the most popular theory about civilization in India is that it sprung up independently along the Indus river valley, it is not counted as part of either East or West. In the book. If it were it wouldn't make any difference most likely as they always lagged behind the far eastern and western cores. and.. don't see how this is important but I can read (and by read I mean sound out) Cyrillic, Arabic, and Korean. I know words in phrases in lots of languages but I can only carry on a conversation in English, Spanish, or Pig Latin. Kalbahamut, what's the name of that book? The link you gave doesn't work. Why the West Rules for Now, by Ian Morris. Here's the link on Amazon. Unfortunately the pdf I found before seems to be missing. Lee is at least as important a figure of world history as Ho Chi Minh and probably moreso. The margin of difference isn't very big, either. Yeah HighFidelity, you are wrong. So wrong. It's only barely, though not sure of what the percentage was then. Maybe some people tried typing in merely "Ho"
Comment on a Jetpunk quiz, they said. It'll be fun, they said. More people knew Gandhi than Franklin, what's your point? So what? Name a country that is more familiar with foreign heroes than their own heroes. It's true. Attaching names to faces means nothing if you don't know anything about who the people actually are. To the quizmaster: I think Mark Twain's real name, Samuel Clemens, should also be accepted. I agree jromance. American historical figures are and should be more important to Americans than foreign historical figures. I am sick of diminishing our great nation so that we can be "less offensive" to the rest of the world. jromance- fair point, and coming from Australia I imagine more people would recognise Captain Cook than Ho Chi Minh also. I was probably overreacting to seeing comments like "pretty sad if you don't know all the US states". ctleng- you're comments are the sort that made me overreact in the first place. Note that the particular foreigner I was talking about caused America to enter the most controversial war in their history- I'm pretty sure that makes them as important as any American historical figure. I didn't get Geronimo and I'm American. But I also did not get Rembrandt or Tolstoy. I was taught a lot of American history, but the facts weren't always accompanied by photos. There is a difference between knowing the historical significance of these people and knowing what they looked like. @High fildelity: the quiz said historical figures, not necessarily WORLD history figures. The Civil War is the greatest challenge in the history of the USA, it was the country tearing itself apart and in MANY cases, brother literally fighting against brother. Why should it be a shock that Americans (and not in such large numbers, seeing by the fact that 63% of takers got Lee wrong) might be able to recognize the chief military figure of the Confederacy? JRomance is 100% right...it is one thing to be completely ignorant of history, but if one is not and merely knows more about the history of their home country than they do of general world and foreign history, then they should not be called ignorant. Also without Lee the war may well have ended differently, and a divided USA would have had a much greater impact on the rest of the world and the course of world history than if Vietnam had remained divided or had become a French or American territory- or a democratic country in the US sphere of influence. Pretty minor event in world history compared to the American Civil War. The breaking of colonial Empires around the world is NOT a minor event. and you are giving Ho way too much credit for that while simultaneously farcically minimizing the impact of the American Civil War. Washington, Jefferson, Bolivar, Hirohito, Sukarno, Gandhi, Selassie, Nasser and many others all came before Điện Biên Phủ, and the majority of them were vastly more important to the ultimate end of European colonialism than late-to-the-party footnote Ho. And Ho Chi Minh came before Dien Bien Phu. He attempted to get a hearing at the Paris Peace Treaties in 1919, in fact. Bandung owed much to the work of the Viet Minh. Or it was eviscerated. Either way. Haha. Yes. and you'd have to be some kind of illiterate moron to think that it was "eviscerated," so, if those are the two options, what I said. You do understand how the word "and" works, right? and the difference between the words "attempted" and "succeeded?" Do you perhaps need help judging which number between 1919 and 1865 is larger? It's Martin Luther King JR. Without that, you mean his father. I got Harry Truman confused for Woodrow Wilson. I feel a little better knowing I'm not the only one. I thought it was Warren G. Harding. Yeah, I'm silly like that. I thought Mark Twain was Jed Clampett from the Beverly Hillbillies! I was trying Joan of Ark. As a mispell maybe this could be ok?! Exactly, but when King James of England made his Bible he left her out of it because she was French and Catholic. I didn't know Joan of Arc was in the Bible! He said Joan of Ark. Douglas MacArthur really looks like Bruce Willis in that picture. The two monarchs I missed. I thought that it was Louis 16th instead of 14th. 15/20. But surprised that only 10% got Tolstoy. One thing is for certain, Americans can't take a bit of criticism, sob sob. It's funny, I managed to create a general knowledge quiz which wasn't biased towards my home country. It's really not that hard. a bit? Try constant and neverending. Every day multiple times a day some idiot (actually legion of them) mouthing off in comments here or on CNN or wherever. Most Americans take it in stride extremely well considering. In fact Americans frequently criticize themselves, or accept the criticism of others and in some cases agree, or just laugh it off. There are tons of examples of American art and culture that contain pointed criticism of Americans themselves, and American humor is very self-deprecating. On the other hand say one negative thing about Canada or England or Australia or Saudi Arabia etc.. somebody reading the comment is going to lose their mind. That's your personal experience, kalbahamut. It probably has something to with the way you're constantly spouting off highly opinionated and offensive tirades against nationalities and religions. No, it doesn't. I'm more often responding to the people I'm referring to than I am inspiring responses by them. I have to agree with kal. The criticisms are constant, unoriginal, and largely inaccurate. Yes, there is a (too large) group of Americans who think the US reigns supreme over everything, and yes, they're annoying. But. The truth, like it or not, is that the US plays an outsized role in world affairs. Our political, economic, and cultural influence dominates all but a small few other countries. The Dutch know more about Americans than vice versa because America is more significant on the world stage. There's also a weird hypocrisy to people constantly trashing Americans for their arrogance...while those same people feel entitled to tell Americans why we are so inferior. And if an American dares to push back, it's somehow a marker of our ignorance or entitlement or whatever else. It's easy to take shots at the US for its "evil empire" tendencies, but compared to the other preeminent powers throughout history, the US is damn near benign. If it is accurate and not hypocritical, I have no problem at all with criticisms of the United States or any other country. I'm not a patriot and don't believe in nationalism. I am generally opposed to bigotry and tribalism and always opposed to false beliefs. The first historical mugshot quiz wouldn't accept "che" without the last name but this quiz accepts "elvis" without the last name. I got 15 out of 20. I could not get Ho Chi minh (among a few others) i thought the picture was of former prime minister tojo of wwii japan. Although Ho Chi Minh does rather resemble master chow from the van damme movie kickboxer...lol. I hate these quizzes. If you think not being able to remember names is embarrassing, try not being able to remember faces. Anyone who didn't get Churchill apparently has never taken a World War II test on this site...he's the picture for almost every one. I'm bound to remark that the German emperor's answer should not be filled in when you type "Kaiser". That is simply the name of his rank. I will admit to never having heard reference to any previous or succeeding Kaiser, nevertheless you should get the point for putting his actual name. Same problem with 'Caesar' in other quizzes, though not, oddly, with 'czar' or 'tzar'. I thought Tolstoy was Santa Claus on a casual Friday and that Mark Twain was Sam Elliot, the actor, though not of any real significance to world history. Truthfully, I thought MacArthur was Ronald Reagan from his acting days. To me he looked like Rasputin. You should accept Ho not minh as the answer. As far as I know, Ho is the surname. You are correct! Ho will work now. Could you add Skłodowska to Curie, after all that's how she was known Maria Curie Skłodowska. Yes, she's Maria Skłodowska - Curie! Wonderful quiz - 100% here! Just because all the European Old Masters and miscellaneous Italians are known today by their first names only doesn't mean they didn't actually have last names! 😉 Please accept "van Rijn" for Rembrandt. The North should have relieved the South of its greatest asset (slavery) moved all the slaves North, to the Caribbean or back to Africa, then expelled it from the union (which would have been moot, given that they had already seceded). Let's see how long it would have taken those "good ole boys" to beg their way back in. I'd say the South's greatest asset after the Revolution was cotton, thanks to Mr. Whitney. Slavery was the horrible means by which they obtained it, and the North was only too happy to use that cotton in their textile mills. Northerners loaned money to southern slaveholders, they insured slaves, they sold goods to southerners and they used slaves in northern cities, too. Even though the slave trade from Africa was abolished in 1808, domestic trading was still allowed. Slavery didn't really end in the north until the Civil War due to "gradual emancipation" in many states. In 1840 there were slaves counted in sixteen northern states, and in the 1860 census there were still over 250,000 slaves counted from northern states. The northern states benefited from slavery, too, they just don't like to admit it. Marie SKŁODOWSKA-Curie, that's full name of this polish scientist. Wow. Only 2 women in the whole quiz. Great job, quizmaster. History doesn't retroactively change to fit itself towards modern conceptions of gender equality. The history of the world up until very recent times was almost entirely the history of men. I thought that Marie Curie looked a little crazy...so I tried Lizzie Borden. Americans should definitely know that portion of World History that is American History better than other parts of world history, just like someone from Russia should know that portion of World History that is Russian History better than history from other parts of the world. This is a common sense. Ho Chi Minh's photo was plastered all over the media during the Vietnam War. To me, he is instantly recognizable; much more so, in fact, than Nguyen van Thieu, the puppet president of South Vietnam during that period. My way of describing if I recognize someone would be if you showed me 20 photos of similar faces of that era, would I be able to select the right person in one or two choices. ---- For example, I got Geronimo correct, but I really had no idea what he looked like. I just started guessing Native Americans (Cochise, then Geronimo, and I would have tried Sitting Bull next). Same with Wilson - I recognized him as a president, but really had no idea which one. I tried a few, and stumbled upon a right answer. Same with Ho, who I got right away. I was ready to try Sun and Chiang in case Ho didn't work. Perhaps Pol next --- but I fully admit I didn't "recognize" him in any fashion. Just started guessing East Asian leaders, and somehow got him right off the bat. I could have sworn that was the guy from Rush. I think Elvis just doesn't sit right in this company. He will slowly fade into obscurity generation by generation, much like Rudolph Valentino or Al Jolson, not really historical figures. Hm. I don't know. The classical composers are still well-known. One is even in this quiz. And no, I'm not suggesting Elvis is on par with Beethoven or Bach, but there is no guarantee he will fade from memory any time soon. You do raise an interesting point though. I think he'll be remembered a lot longer than Chaplin will. *every* historical figure is doomed to eventually fade into obscurity, and eventually into complete oblivion, on a long enough time line. Even Jesus and Muhammad and Alexander. Eventually. Elvis will, too. Hard to say if, 500 years from now, he'll be as well remembered as Beethoven. Probably not. But maybe. If humans even still exist then. I think Malbaby is probably right. Please accept Chi Minh, I wrote it, but it does not work. Why? That was not his family (surname). This site doesn't usually accept just first names (as we call them in English). Still trying to work out what i typed to get Ho Chi Minh before i saw the picture. I would have got it anyway, but weird! Why did it not take 'Rembrand' for an answer? I forgot the one T and that's that? It took just writing 'Ho' for Ho Chi Minh! I read "Rembrand" with a French pronounciation. I wanted to type Louis XIV, but Louis was accepted before I had the chance. And then it only gave me 67% for that answer.